A fur-raising journey through time! 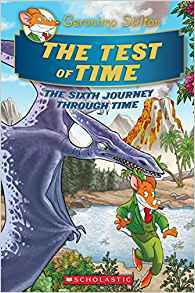 I, Geronimo Stilton, found myself traveling through time once again! While testing his latest time machine, Professor von Volt accidently brought some history into the present. Tops, our triceratops friend, Helen of Troy, Attila the Hun, Charlemagne, and Christopher Columbus were all in present day New Mouse City! My friends and I climb into the new time machine to take them back in time. But we aren’t sure the new machine works perfectly! Can we return everyone to their proper place in time and make it back in one piece?